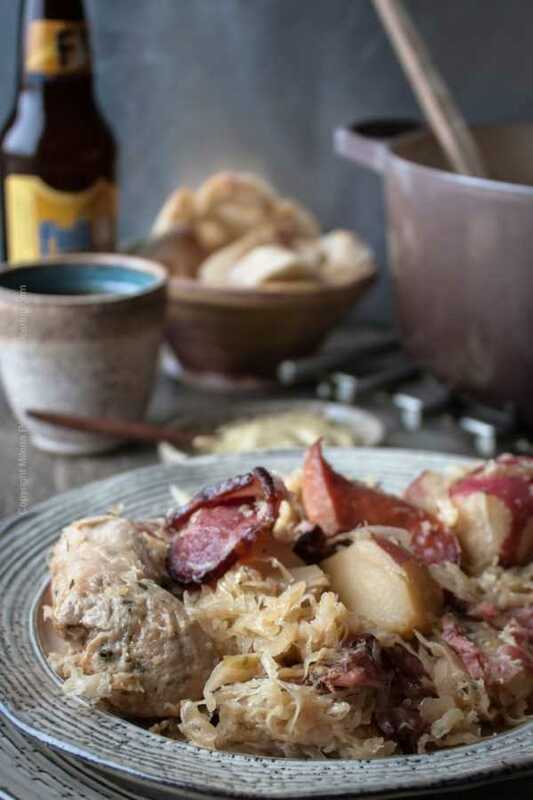 Choucroute garnie is a slowly baked Alsatian dish combining sauerkraut, sausage, meats, potatoes and spices. 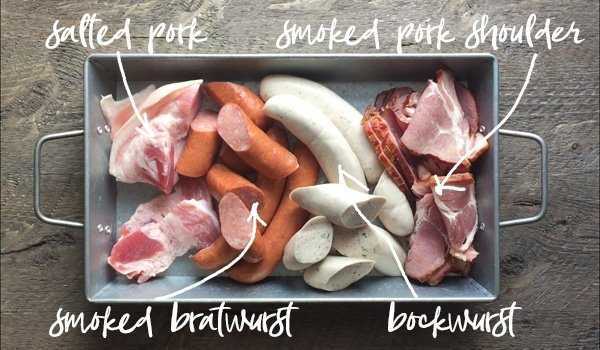 One of the traditional ways to make choucroute garnie is with lager from Alsace, the other one with the dry Alsatian Riesling, which we prefer to the overly sweet German variety. But since we are all about cooking with beer, I made it with our favorite beverage. 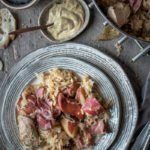 The French of the Alsace region borrowed the idea of choucroute garnie from their neighbors, the Germans of Schwarzwald and Bavaria. 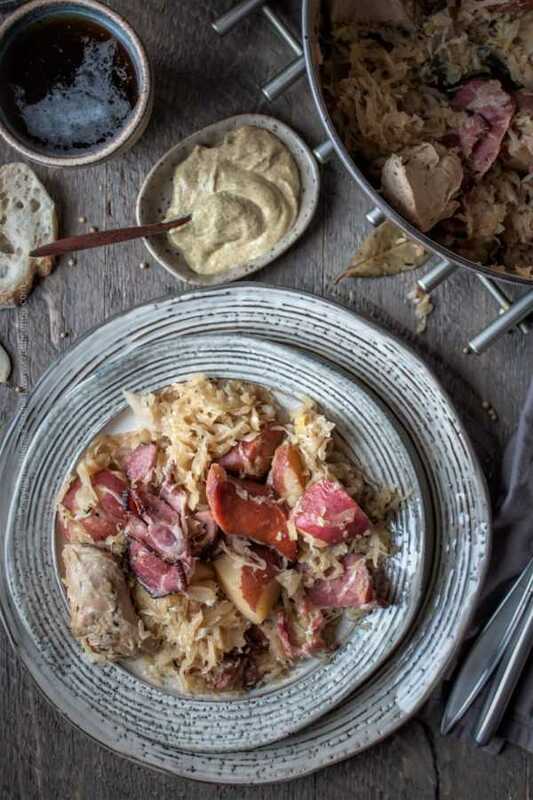 Choucroute means ‘sauerkraut’ in French and ‘garnie‘ translates to ‘garnished/dressed’. The correct pronunciation is shü-ˈkrüt garni. The traditional method involves heating up the sauerkraut with beer or wine and pork or goose fat, then adding spices and charcuterie. The dish is also one of those where there are hundreds of variations to the main recipe, both in the method of preparation and the ingredients used, with everyone customizing it as they see fit. It is a bit of an unsightly dish (perhaps more than a bit), but as soon as you smell it its unrefined appearance will cease to matter. My favorite thing about it is not the sauerkraut. Not even the beer that provides most of the liquid. It is the smoked meats. This is a fabulous dish in that it contains everything for a complete meal. Kitchen equipment wise all you need is a single heavy bottomed pot with a lid that can be placed in the oven. A Dutch oven works great, or use something similar. Watch me make it in the video. 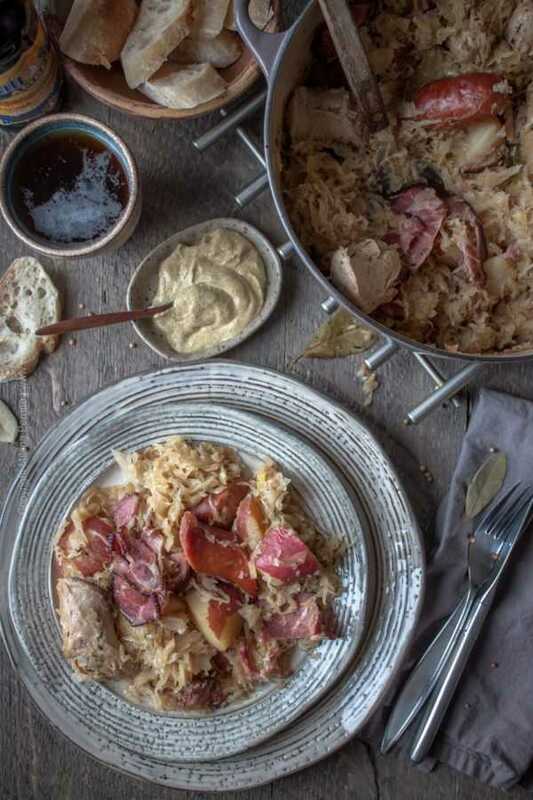 Choucroute garnie, aka 'dressed sauerkraut' is a classic dish of the French region of Alsace. It combines sauerkraut, a variety of sausages and smoked meats, onions, potatoes and spices. Turn oven on to 300 F.
In a deep heavy bottomed pan such as a Dutch oven over medium heat render the fat from the salted pork (or bacon). Remove the pork from the pan and reserve it to add it back along with the rest of the meats. Add the red potatoes and brown for about 5 minutes. Add the onion, stir and cook until it softens a bit, about 2-3 minutes. Add a third of the sauerkraut right on top of the potatoes and onion. Add half the garlic, 1 bay leaf, half of each of the spices and half of all the meats (including the reserved salt pork or bacon). Cover with another third of the sauerkraut. Add the remaining garlic, bay leaf, spices and meats. Add the last third of sauerkraut on top and then pour the beer over the ingredients. Cover with the Dutch oven lid and move to the preheated oven. Bake for an hour and a half. Remove from oven and serve. You can choose to keep the sausage links whole and cut them in smaller pieces before serving. Feel free to adjust spices to taste and exclude any you do not like. Serve with rye bread or soft pretzels. Serve with side of mustard. Choucroute garnie recipes typically list Juniper berries as one of the spices needed. I’ve also listed them in our recipe card, but since I absolutely dislike them, I had to leave them out from the actual dish I prepared in the video. Traditionally, the beer the French use in choucroute garnie is a crisp, clean lager from Alsace (influenced by the nearby German lager heritage). The most popular representative is 1664, a pale lager brewed by Kronenbourg brewery in Obernai, Alsace. The brewery was founded in 1664 (it turned 350 years old in 2014), but sadly, in 2014 was acquired by beer giant Carlsberg Breweries. I tried to find an Alsatian lager from an independent regional brewery such as Brasserie Du Pecheur and their Pils d’Alsace, but wasn’t able to find any here in Fort Collins. I almost went with the 1664, briefly considered substituting with a Munich Helles, which would have been an excellent alternative, but then spotted an amber ale I simply looove for its confident maltiness and subtle spice and thought that it will balance the tartness of the sauerkraut even better than the helles. It is the Full Sail Amber Ale from Bend, OR. I know, I know…nothing to do with a pale lager, but it delivered more flavor. Sometimes one just has to obey the dictates of one’s taste buds and impulses, especially when it comes to cooking with beer. If you like rye bread, it is the type traditionally served with this dish in Alsace, along with brown mustard. But even a hot dog bun will taste incredible with the flavored sauerkraut and smoked charcuterie of a choucroute garnie. Some say it is a manly dish, but I’d disagree:) Make it and tell me what you think. PS PS. 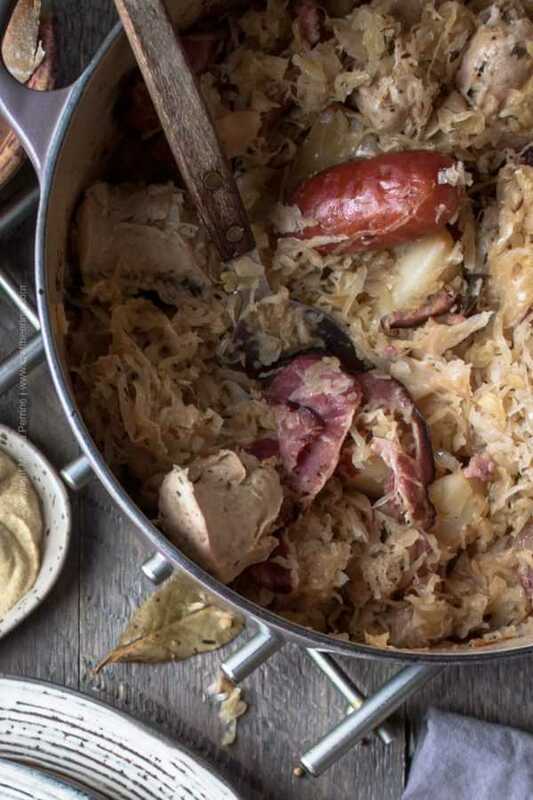 Choucroute garnie is very, very similar to a traditional Bulgarian sauerkraut dish called Kapama of which there are also hundreds of versions. It calls for a variety of meats, including veal and chicken and is not traditionally prepared with beer or wine. Kapama can be improved upon with the right beer though (done that:) and some day in the future I will cook it up for the blog. It requires a special large piece of clay pottery to be cooked in and is meant to serve a large group of people (8-10 at least), but I have made it before in our cute individual Bulgarian clay crock pots and it tasted just as good. If you enjoyed spending time on Craft Beering we sincerely invite you to join us on Instagram, Facebook, & Pinterest or enter your e-mail in the subscription box below (we’ll send you a list of all new posts every two weeks). I have never heard of this dish – but now I really want to try your recipe – pinned! Thanks for sharing at the What’s for Dinner party! My husband brought home some juniper berries (His responsibility is to shop or some ingredients I’ve never heard of 🙂 ). I’m not sure what to do with it but since you dislike it, I might have to find other usage of it or not using it at all 🙂 This choucroute garnie though!! sauerkraut, salted pork, sausages!!! oh my… the carnivore in me is speaking now! Please don’t let my awkwardness stop you from discovering a good ingredient! I just dislike some things for no apparent reason:). Juniper berries…Cheers to us carnivores! Thank you for stopping by, Barrie! We will love this recipe! Thanks so much for sharing your post with us at Full Plate Thursday. Have a great week and come back soon! Amen! It is all about the right beer:) Thank you, Rachelle. Fabulous dish! My husband would inhale this, as it has all his favourite foods (plus beer 🙂 in one dish. Putting this one on the menu for him! Haha, I’d like to see him inhale choucroute:) Thank you, Jennifer. I’m learning so much, and I’m liking it. Never heard of this dish, even if we’re neighbors 🙂 . It does not look ugly at all, you did a fantastic job with the pics and I can smell/taste the flavors. Although I am mostly vegetarian (and a bit pescatarian), if Loreto makes a meat dish that intrigues me, I still taste it and give him my opinion. And I would definitely taste this dish! Cool! I would try it some day folded into a large sliced or freshly baked rye bread, kind of like a taco fold…But where to get the freshly bakes rye bread around here…might need to learn to bake it myself, lol. Thank you, Dawn! So as I was reading your post I was like, wow this photography is amazing! I could see these pics turning really ugly. . .and then I got to the part where you said it’s an unsightly dish. You totally managed to make it look pretty! And I have to say just how much I looooove sauerkraut! I eat it almost every day, but I’ve never heard of this dish–I’m intrigued. Hope you’re having a great week! You crack me up, Kelsie. I tried to choose good looking plates, because sauerkraut, as much as it is sooo good for you and so tasty just doesn’t have the looks:) I am really happy to read your comment, thank you!